Diabetes: Studies have shown that type 1 diabetics who consume high-fiber diets have lower blood glucose levels and type 2 diabetics may have improved blood sugar, lipids and insulin levels. One medium banana provides about 3 grams of fiber. The Dietary Guidelines for Americans recommends 21-25 g/day for women and 30-38 g/day for men. Blood pressure: Maintaining a low sodium intake is essential to lowering blood pressure, however increasing potassium intake may be just as important because of its vasodilation effects. According to the National Health and Nutrition Examination Survey, fewer than 2% of US adults meet the daily 4700 mg recommendation. Also of note, a high potassium intake is associated with a 20% decreased risk of dying from all causes. Heart health: The fiber, potassium, vitamin C and B6 content in bananas all support heart health. An increase in potassium intake along with a decrease in sodium intake is the most important dietary change that a person can make to reduce their risk of cardiovascular disease, according to Mark Houston, MD, MS, an associate clinical professor of medicine at Vanderbilt Medical School and director of the Hypertension Institute at St Thomas Hospital in Tennessee. In one study, those who consumed 4069 mg of potassium per day had a 49% lower risk of death from ischemic heart disease compared with those who consumed less potassium (about 1000 mg per day). High potassium intakes are also associated with a reduced risk of stroke, protection against loss of muscle mass, preservation of bone mineral density and reduction in the formation of kidney stones. Treating diarrhea: Bland foods such as apple sauce and bananas are recommended for diarrhea treatment. Electrolytes like potassium are lost in large quantities during bouts of diarrhea and may make those affected feel weak. Bananas can help to promote regularity and replenish potassium stores. Preserving memory and boosting mood: Bananas also contain tryptophan, an amino acid that studies suggest plays a role in preserving memory and boosting your mood. One medium banana (about 126 grams) is considered to be one serving. One serving of banana contains 110 calories, 30 grams of carbohydrate and 1 gram of protein. Bananas are naturally free of fat, cholesterol and sodium. 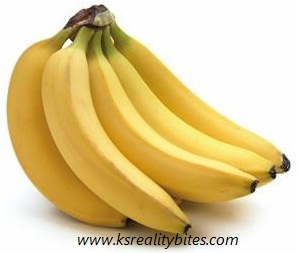 The recommended intake of potassium for adults is 4700 milligrams per day.